Mystery Adventures with Nancy Drew - Plus the Hardy Boys! Compared to the Nancy games listed in my previous post (for games 2000 to 2003), the games in this post, just get better and shows just how well the game developers have done to produce top detective games that hit all the right notes for fans of this teen sleuth. From the quality of the graphics, background music, voice acting and sound effects to create the right atmosphere. To the standard and level of challenge in the gameplay. And all within great storylines that evoke the spirit of the original Nancy Drew books. Plus in this list of Nancy Drew games are two that also feature the Hardy Boys, famous for their own teenage detective stories from the same publishers. They've been incorporated into the games with great success. The game titles listed in this post are of those that were released from 2004 to 2007. For details of other top Nancy Drew PC games visit my other post, link included below. As before, I have put the games in this post a in time order list. Each includes a quick review of the good and bad points plus a link to where you can get the download versions of the PC games online. 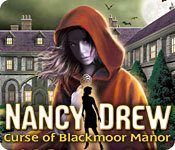 Join Nancy Drew for a thrilling mystery in Nancy Drew - Curse of Blackmoor Manor! All is not well in Blackmoor Manor, a Fourteenth Century English mansion haunted by a tragic past. You, as Nancy Drew, embark on your first international adventure to visit Linda Penvellyn, your neighbor's daughter and newlywed wife of a British diplomat. A mysterious malady keeps Linda hidden behind thick bed curtains. Is she hiding from something or someone, or is a more menacing threat stalking her? Face your fears to find the truth! Dare to play Nancy Drew(R) - Curse of Blackmoor Manor today! * Released 2004 by Her Interactive, Inc.
UK Amazon: 4 in 1 PC Bundle. This Nancy Drew PC game bundle includes Shadow Ranch, Curse of Blackmoor Manor, White Wolf of Icicle Creek and Legend of the Crystal Skull. Join Nancy Drew for her first mystery ever in this interactive adventure based on the first Nancy Drew book! The year is 1930 and Nancy has been invited to visit Emily Crandall in Titusville. Emily and her mother had been counting on the generosity of their kindly, but strange, neighbor Josiah Crowley to support their inn. But, in his will, Josiah left everything to his ESP teacher Richard Topham. A contested will, a suffering girl, and a suspicious psychic . . . help Nancy solve the mystery before time runs out! * Released 2005 by Her Interactive, Inc.
UK Amazon: 3 in 1 PC Bundle. 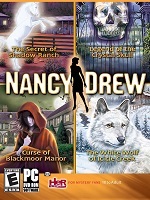 This Nancy Drew PC game bundle includes Curse of Blackmoor Manor, Secret of the Old Clock and Secret of Shadow Ranch. 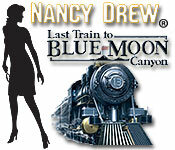 Hop aboard a thrilling ride to adventure with Nancy Drew – Last Train to Blue Moon Canyon, the next exciting mystery for the spunky junior detective! The Hardy Boys have invited Nancy Drew on a train ride out West where the greatest detective minds of the moment have gathered to solve a century-old secret. The luxurious train once belonged to Jake Hurley who set out to find the mother lode during the old mining days. Jake's train was later found in Blue Moon Canyon with the engineer dead and Jake missing. He was never heard from again. 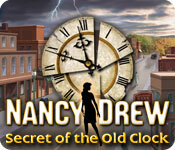 Punch your ticket as Nancy Drew and uncover what happened! Was Jake a victim of foul play or does the mystery run deeper? Trace the footsteps of that fateful trip and investigate all corridors of the train. Find important clues by solving puzzles, talking to other investigators and perhaps even coming face-to-face with a ghost! 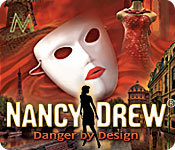 Take the Paris fashion world by storm in Nancy Drew® – Danger by Design, and solve an intriguing new mystery from the case files of the adventurous ace detective! Dare to play Nancy Drew® – Danger by Design and sew up this case before it falls apart at the seams! 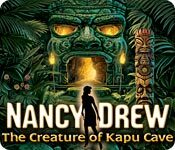 * Released 2006 by Her Interactive, Inc.
Track an ancient legend through Hawaii and solve an environmental mystery in Nancy Drew – The Creature of Kapu Cave, the newest adventure from the exciting detective series! Trouble is brewing in paradise as someone or something destroyed important environmental experiments and pineapple crops on the big island of Hawaii. Luckily, Nancy Drew has taken an internship there to study insects and is now on the trail to solving this new case. Was the culprit a trouble-making thief or is it Kane 'Okala, a mythical creature said to be taking revenge on random victims? Step into Nancy's shoes and find out! Take a walk through many of the island's beautiful locations and find the evidence to figure out who or what is causing the problems. Question suspects, uncover clues, and even design seashell necklaces, but don't forget your intern duties. If all else fails, call on your friends the Hardy Boys and bring them into the investigation! Solve a perplexing mystery plaguing a rustic lodge in Nancy Drew(R) - The White Wolf of Icicle Creek. Mournful howls and thunderous explosions roll across the frozen Canadian mountains surrounding the Icicle Creek Lodge. Former guests say that the resort is jinxed, but the staff blames a mysterious wolf. Is the wild animal connected to a lurking saboteur, or is the wolf warning the residents of bigger danger? It’s up to you, as Nancy Drew, to uncover the secrets before someone leaves you out in the cold! Follow a trail to hidden secrets and sabotage! 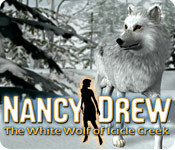 Dare to play Nancy Drew(R) - The White Wolf of Icicle Creek today! * Released 09 January 2007 by Her Interactive, Inc. 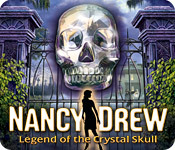 The search is on for an unearthly artifact in Nancy Drew - Legend of the Crystal Skull. Bruno Bolet was the proud owner of the "Whisperer," a crystal skull rumored to protect its holder from almost any cause of death - except murder. When Bruno passed away, his nephew Henry came to wrap up his affairs, but he couldn't find the skull among the clutter of the creepy Bolet manor. You'll need to team up with Nancy's best friend Bess Marvin to find this mystical artifact before it falls into the wrong hands! A delightful advneture for all ages, join Nancy on this intriguing whodunit before it's too late! * Released 2007 by Her Interactive, Inc.
For more top Nancy Drew games, check out my previous post: Best Nancy Drew PC Games - Part 1.